The new Italfarad PFC5 Power Factor Correction electronic regulator, fully controlled by microprocessor, incorporates a lot of innovative features when compared to the previous regulator designs, in particular the temperature control and a serial interface RS232. The interface RS232 allows the set-up of the regulator by computer, as well as by the push-buttons, and to check the operating parameters on a computer. It is also possible to verify the level of functioning of the automatic PFC equipment by means of special software. 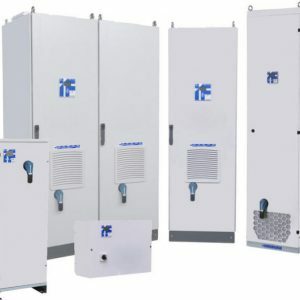 The PFC5 regulator allows automatic set-up, without the need to set the capacity, the CT direction and the power of the first bank, if the power of the banks is a multiple of the first (binary system), i.e. 1 – 2 – 4 – 8 -16. Once the regulator is set, it is possible to block the push-buttons to prevent manual adjustment of the operating parameters and settings. SKU: PFC5. Category: Powerfactor correction electronic regulator. 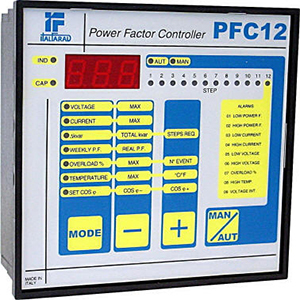 Tags: italfarad, PFC5, power factor correction, POWER FACTOR CORRECTION REGULATOR 5, regulator.